CONCORD, N.C. — RC Media Photo — Tuesday’s Bojangles’ Summer Shootout was heavy on action and championship drama, as the seventh round of racing at Charlotte Motor Speedway featured lots of on-track battles in addition to a pre-race autograph session featuring NASCAR standouts Erik Jones, Matt DiBenedetto, Tyler Reddick and Cole Custer. Like the sixth round of the season, Tuesday’s Bojangles’ Summer Shootout brought to a close an eventful day of action at Charlotte. Jones joined Monster Energy NASCAR Cup Series stars – and former Bojangles’ Summer Shootout drivers – William Byron and Joey Logano as well as other big names at the second ROVAL™ Test Fest. The shakedown saw NASCAR’s biggest names testing the 2.28-mile, 17-turn ROVAL™ road course oval before the quarter-mile, four-turn frontstretch oval took center stage in the evening. For the second week in a row, Luke Morey beat Sean McElearney to the finish line in the Beginner Bandit feature. Morey’s win came two years to the day after his grandfather passed away. He and the team were all smiles in victory lane, and the youngster admitted he was surprised with the last lap challenge. John Craig shook up the championship picture in the Cabarrus Brewing Company Masters division, as the driver of the No. 1 Legend Car grabbed the No. 1 finishing position for the first time this season. Robby Faggart rocketed to second place by Lap 15, but the 2016 Masters division champion saw his run to the front – as well as his bid for victory – evaporate with six laps to go. Faggart’s car jumped to the inside of Craig’s as the cars exited Turn 2, but the cars made slight contact, which sent Faggart spinning to the infield grass. He finished 10th. Craig rode to the finish line ahead of Rodney Tharp and Carl Cormier to score the win. JR Motorsports development driver Sam Mayer invited members of his late model race team to catch the Bojangles’ Summer Shootout on Tuesday night. The Legend Car Pro division title contender delivered a show, too – rallying from eighth place and an early-race “moment” – in which Mayer nearly went for a spin – to collect the victory. Two red flags and a slew of yellow ones populated the K1 Speed Young Lions feature, which saw Isaak Love avoid the trouble and finish in front. A caution-filled VP Racing Fuels Semi-Pro feature saw Harrison Halder take the checkered flag after a slew of accidents shortened the 25-lap race to 18 circuits. Halder nailed the final restart and pulled away to register the win over Tristan Love, Sammy Smith, Gracie Trotter and Tristan Lesik. 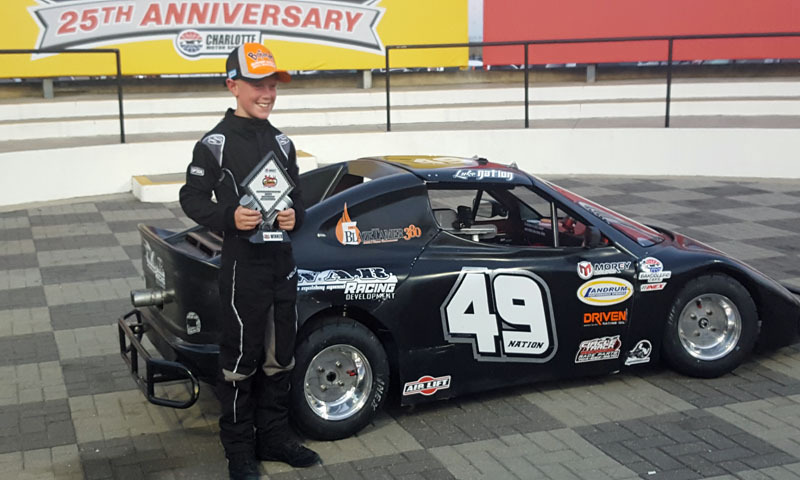 Cameron Bolin made his first start of the year in the Schools USA Bandolero Outlaw division count on Tuesday night. Bolin, a regular visitor to the winner’s circle in recent Shootout seasons, prevailed over Garin Mash and Justin Gareis. While the top three drivers’ fastest laps were separated by a scant 0.008 seconds – in favor of Gareis, the points leader – Bolin prevailed by a convincing 1.35 seconds. Jadyn Daniels and Ethan Norfleet rounded out the top five. Kade Brown, Zack Miracle and Landon Rapp engaged in a spirited, three-wide battle for Bandolero Bandit supremacy on Tuesday night. In a feature resembling the two- and three-wide racing in May’s Monster Energy NASCAR All-Star Race, Miracle managed to pull away in the closing stages to grab a well-earned victory. “I knew I had a good enough run and I just stuck it in there,” Miracle said. © Race Chaser Online. All Rights Reserved. error: This content is copyrighted to Race Chaser Online.